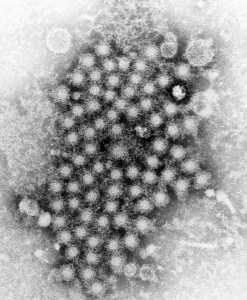 In the United States, hepatitis A, hepatitis B and hepatitis C are the most common types, but also included are hepatitis D and E.
This publication describes the efficacy and safety results from two Phase 3 clinical trials, ENDURANCE-1 and ENDURANCE-3, in patients with chronic HCV genotypes (GT) 1 or 3 infection who were treated with an all-oral, once-daily combination regimen of direct-acting antiviral agents (DAA) glecaprevir (GLE) at 300 mg and pibrentasvir (PIB) at 120 mg. The findings from ENDURANCE-1 trial show that the GLE/PIB combination regimen (G/P) given for 8 weeks to HCV GT1 chronically infected non-cirrhotic treatment-naïve or treatment-experienced (with sofosbuvir and/or interferon with ribavirin) patients was safe and well-tolerated, achieved high efficacy with a sustained virologic response at post-treatment week 12 (SVR12) rate >99% and was non-inferior to 12-week treatment with G/P. The trial also included subjects who were co-infected with human immunodeficiency virus (HIV), and all of these subjects achieved SVR12 while maintaining HIV suppression throughout the study. ENDURANCE-3 trial results show that the G/P regimen given for 8 weeks to HCV GT3 chronically infected non-cirrhotic treatment-naïve patients was safe and well-tolerated, achieved high efficacy in this historically difficult to cure GT with an SVR12 rate >94%, and was non-inferior to 12-week treatment with G/P, which in turn was non-inferior to the treatment with 12-week DAA regimen of sofosbivir and daclatasvir. Response: In the recent years, several interferon-free all-oral DAA combination regimens have become available for the treatment of patients with chronic HCV infection. This publication shows that G/P treatment course as short as 8 weeks is highly efficacious and safe in a large number of these patients, such as those who do not have liver cirrhosis and either never received treatment for HCV infection (those with HCV GTs 1 or 3 infection) or were treated in the past with sofosbuvir and/or interferon with ribavirin (those with HCV GT1 infection). Beyond the ease and convenience of delivering a treatment course with a short duration, such a short therapy may offer additional benefits to certain groups of patients, for example, those who have difficulty with adhering to longer treatment courses.2,3 Thus, G/P regimen can play an important role in the HCV infection treatment and elimination efforts. Response: It will be important to conduct studies to evaluate the effectiveness of the 8-week G/P regimen in real-world settings. It will also be important to evaluate the public health benefits of this 8-week regimen in terms of increasing access to underserved populations (e.g. people who inject drugs, pediatric patients) and the potential downstream impact on HCV elimination efforts. In addition, because this treatment regimen does not require baseline resistance testing or on-treatment liver function monitoring, it would be of interest to examine the ability of this pangenotypic 8-week regimen to further simplify HCV treatment for patients without cirrhosis. Response: Phase 3 studies also demonstrated high SVR12 rates for HCV GT2, 4, 5 and 6-infected patients without cirrhosis following 8 weeks of treatment with G/P4,5. These data, in combination with the results from the studies in this publication, supported the recent marketing approval of G/P in the US and Europe as an 8-week treatment regimen for patients without cirrhosis across HCV genotypes 1 to 6 including those with HIV co-infection and all stages of kidney disease (including those on dialysis). World Health Organization (WHO). Global hepatitis report, 2017. http://www.who.int/hepatitis/publications/global-hepatitis-report2017/en/. Accessed on 23 January 2018. Petersen T, Townsend K, Gordon LA, et al. High adherence to all-oral directly acting antiviral HCV therapy among an inner-city patient population in a phase 2a study. Hepatol Int. 2016;10(2):310-9. Townsend K, Petersen T, Gordon LA, et al. Effect of HIV co-infection on adherence to a 12-week regimen of hepatitis C virus therapy with ledipasvir and sofosbuvir. AIDS. 2016;30(2):261-6. Asselah T, Kowdley KV, et al. Glecaprevir/Pibrentasvir for Eight or Twelve Weeks in Non-cirrhotic Patients with HCV Genotype 2, 4, 5, or 6 Infection. Clin Gastroenterol Hepatol. 2017 Sept 22. Rockstroh J. LK, Viani RM, et al. Efficacy and Safety of Glecaprevir/Pibrentasvir in Patients Co-infected With Hepatitis C Virus and Human Immunodeficiency Virus-1: The EXPEDITION-2 Study, #522, In International Liver Congress, Amsterdam, Netherlands, 2017. Steven Flamm, M.D., Paul Kwo, M.D., Gregory J. Dore, Ph.D., M.P.H., Gladys Sepulveda-Arzola, M.D., Stuart K. Roberts, M.D., et al. This entry was posted in Abbvie, Author Interviews, Hepatitis - Liver Disease, NEJM, Pharmaceutical Companies and tagged hepatitis by Marie Benz MD FAAD. Bookmark the permalink.